Cas9 (CRISPR associated protein 9) is an RNA-guided DNA endonuclease that targets and cleaves DNA sequences complementary to its guide RNA (gRNA). 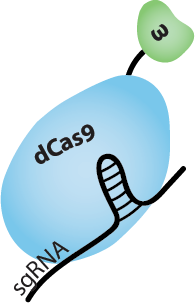 Catalytically “dead” Cas9 (dCas9) lacks the ability to cleave DNA. Fused to the omega (ω) subunit of RNA Polymerase (RNAP), fusion dCas9-ω can act as a programmable transcription activator. In addition, activating dCas9 might also act as a DNA transcription inhibitor: if the sequences targeted are close to the RNAP binding sites, dCas9-ω would sterically hinder RNAP recruitment. This part can be considered as an improvement of the biobrick dCas9-ω Activator (BBa_K1218014) : BBa_K1723000 is designed to work using sgRNAs  (single guide RNA, such as BBa_K1723002) as guide RNAs, instead of tracrRNA/CRISPR array system. SgRNAs are more modular as they can be produced separately when needed in CRISPRi context. Also, the production of the complex is faster as less processing steps are needed .This protein is only active in the JEN202 E. coli strain, which lacks the rpoZ gene . Note that this protein is toxic for the host when overexpressed . dCas9-ω structure with gRNA. In grey we have dCas9, in red the gRNA scaffold, in blue the gRNA 20bp specificity determinant sequence and in green the ω RNAP subunit. It is often important to visualize proteins, as their 3-D structure can give information about functionality. Unfortunately, a PDB file is not available as X-ray cristallography data on this protein are lacking. 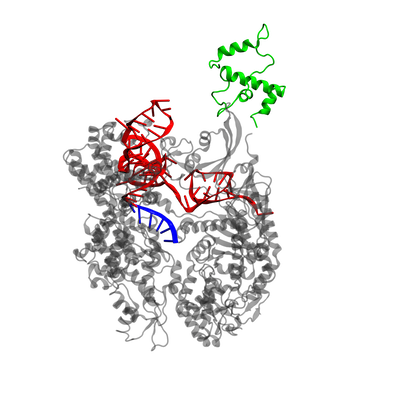 However, it is possible to extract the ω subunit directly from the RNA polymerase (RNAP) and align it with the dCas9 protein structure. This is the result of the alignment and this is our 'predicted' 3D structure of our protein. Bikard, D., Jiang, W., Samai, P., Hochschild, A., Zhang, F., & Marraffini, L. A. (2013). Programmable repression and activation of bacterial gene expression using an engineered CRISPR-Cas system. Nucleic acids research, 41(15), 7429-7437. Alec AK Nielsen & Christopher A Voigt (2014). Multi-input CRISPR/Cas circuits that interface host regulatory network. Molecular systems biology, 10(11), 763. Qi, L. S., Larson, M. H., Gilbert, L. A., Doudna, J. A., Weissman, J. S., Arkin, A. P., & Lim, W. A. (2013). Repurposing CRISPR as an RNA-guided platform for sequence-specific control of gene expression. Cell, 152(5), 1173-1183.